Speedy Elektra Adds Electric Power Drive To Any Wheelchair | OhGizmo! 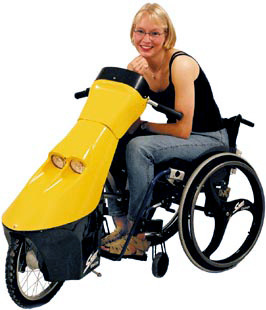 The company who brought us the Pedal Powered Wheelchair actually has a wide-range of wheelchair accessories including this electric model called the Speedy Elektra which is designed for those who aren’t physically able to pedal. Using an easy four-step process, the Elektra can be connected to a wheelchair by the user without any assistance, and in addition to a variable speed twist grip, it also offers a handy reverse gear. Unfortunately I have no idea what the top speed, battery life or range of the Speedy Elektra is (why would a company include any useful info on their website?) but I have to assume it’s a more affordable solution than buying an actual electric wheelchair. Yeah some technical specs WOULD have been useful, so of course the maker didn't bother to mention any of those.